Hailing from the Hudson Valley, the versatile Shovel Ready String Band performs heartfelt original songs alongside up-tempo fiddle tunes, country blues, bluegrass and traditional ballads of love and loss. Featuring tight vocal harmonies and polished arrangements, the band has appeared at many fine local venues. We're happy to welcome them back to the Towne Crier. Like all great marriages, the members of Breakneck Annie started out as friends and then became bandmates. With roots as a kitchen and back-porch band, playing at their own parties, Breakneck Annie tries to keep and present that feeling of friends who really like to make music together. 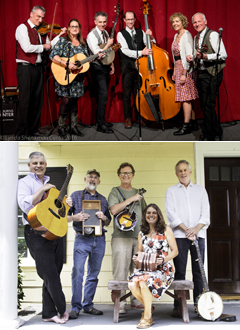 Whether playing at festivals, farmers markets, open mics, private parties or Irish wakes, they try to bring fun as well as traditional-style music to all their events. Shovel Ready String Band/Gold Watch and Chain from Piper7Media on Vimeo.